I500 original WMS artwork, produced with latest Next Gen process. Includes Door, Right Side, Left Side, Right Backbox, Left Backbox. Full 5 Piece Set Of I500 Pinball Cabinet Decals. This Is a Genuine Licensed Product. New "Next Generation 2" Version Printing on State of the Art Print Machines that Produces a Product to Exact Williams Specifications but is Better than New. 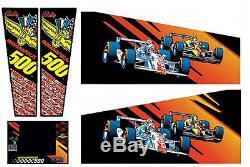 The item "I500 Indianapolis 500 Pinball Machine Cabinet Decals NEXT GEN LICENSED" is in sale since Saturday, October 14, 2017. This item is in the category "Collectibles\Arcade, Jukeboxes & Pinball\Pinball\Replacement Parts". The seller is "classicarcades" and is located in Wilkes-Barre, Pennsylvania. This item can be shipped worldwide.